The FEMtools Modal Parameter Extractor (Ft-MPE) module is a FEMtools add-on tool for extracting modal parameters (natural frequencies, mode shapes and modal damping) of a structure from a set of Frequency Response Functions (FRFs) or cross-power spectra (XPS) that are computed from response time series. Modal parameters can be used for applications in structural dynamics or to validate and update a finite element model. The extractor can be used interactively or as a component of an automated process for structural health monitoring and evaluation. The Ft-MPE is installed and used as an add-on to the FEMtools Framework or any other FEMtools configuration. Extraction of modal parameters using a global poly-reference Least Squares Complex Frequency (pLSCF) method or a local curve-fit method. Classical (input-output) or operational (output-only) modal analysis. Operation using an interactive applet or command-driven. Interactive reference and response selection (applet only). Frequency-domain operational shapes viewer (applet only). Automatic or manual pole selection based on a stabilization chart (global method only). Narrow or wide band extraction (minimum and maximum frequency specification). Multiple frequency band selection and combination of poles (global method only). Extraction of complex or normal mode shapes. Residual modes to compensate out-of-band modes (global method only). Validation of the extracted mode shapes using auto-MAC, mode complexity analysis, FRF re-synthesis and animated mode shape plots. Process imported time histories (detrending, filtering,...). Automatically select the optimal reference channels to compute the cross-power spectra for operational modal analysis. Computation of cross-power spectra from time series. Support of a roving batch of sensors (multiple measurement setups with the same reference channels) for operational modal analysis. Digital filters to remove certain frequency components from time series. The following types of filter are supported: low-pass, high-pass, band-pass, band-stop. Re-sampling of time series to decimate the number of samples. Removing DC components or linear trends from time series. Extracting general information on the imported time series. Import and export of FRFs, time series and modal parameters is done using the Universal File format or custom translation scripts. Import and display time histories. Interactive graphics display of animated mode shapes, FRF curves etc. Automated data processing using scripts. The FEMtools Modal Parameter Extractor (Ft-MPE) module is used to extract the modal parameter (natural frequencies, mode shapes and modal damping) from Frequency Response Functions (FRF) for classic input-output modal analysis (EMA) and from time histories obtained under operational conditions (operational modal analysis; OMA). Using third party tools, FRFs can be experimentally obtained using hammer or shaker excitation and the response signals, usually accelerations, are divided by the known excitation signal to obtain FRFs. By curve-fitting these FRFs, the modal parameters can be identified with FEMtools MPE. Under real operating or ambient conditions, the excitation signal is unknown and no FRFs can be obtained. In this case, cross correlation spectral functions are used to extract the modal parameters. FEMtools MPE can import time histories, compute cross correlation functions and extract the modal parameters. Dynamic response analysis - Dynamic analysis relies on modal superposition of mode shapes for response analysis in time or frequency domain. Structural dynamics modification - Predict the effect of changes to stiffness, mass and damping in modal space. Modal coupling - Simulate the dynamic response of assembled structures, using coupled modal models obtained from test or FE analysis. Pretest planning - The modal extraction process can be evaluated using simulated test data as part of a virtual testing process. Test-Analysis modal correlation - Comparing reference test modes with predicted modes provides a mean to validate simulation models. FE model updating - Finite element models can be updated by improving the correlation between reference test modes and predicted modes. FRF resynthesis - Test FRFs can be smoothed by re-synthesis from extracted modal parameters which is recommended if these FRF will be used for FRF-based updating of FE models. Rigid body properties extractor - To obtain a better mass line for rigid body properties extraction, the first resonance peaks can be removed from the FRFs. This is done by modal extraction and re-synthesis without including the first mode shape. Material identification - Identification of material properties using mixed numerical-experimental vibration analysis. Modal extraction provides a way to identify the mode shapes of a test sample. Structural health monitoring - Modal extraction is a component of a system for automated monitoring of modal parameters in structures. Easy to Use - Only minimal user-interaction is required and all functions are combined in an interactive applet (see figures). Powerfull - Using efficient algorithms and optimized DSP functions, modal extraction is fast. On 64-bit platforms, it is possible to use a very high number of channels and a wideefrequency range in a single pass without running into memory limitations. Reliable - Reliable and stable methods are used for global and local extraction of modal parameters. Out-of-band modes are taken into account to compensate residual effects and improve extraction accuracy. Flexible - Modal extraction can be operated manually or used as part of an automated process. The FEMtools MPE add-on requires a separate license that is used together with a license for any FEMtools standard configuration. Modal analysis of a satellite structure using the global MPE applet. 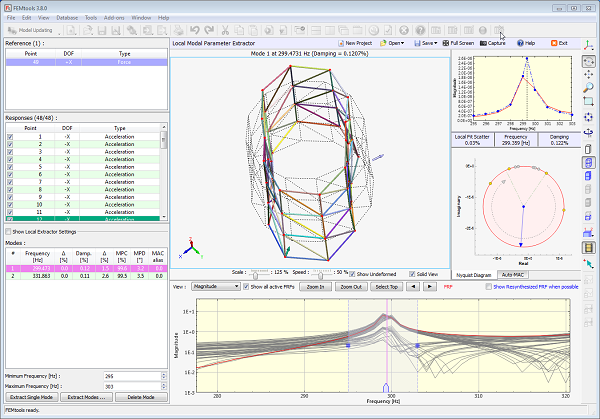 The screen shot of the FEMtools MPE user interface shows the (a) FRF selection, (b) stabilization chart, and (c) mode shapes, overlay of original FRF and re-synthesized FRF and autoMAC plot. Local curve fit of FRFs with mass loading (local MPE applet).